Excluding the "because it's what my religion teaches" explanation, and trying to discuss this solely based on logic, why are human beings any more valuable and why do they have some kind of greater right to life than an animal? 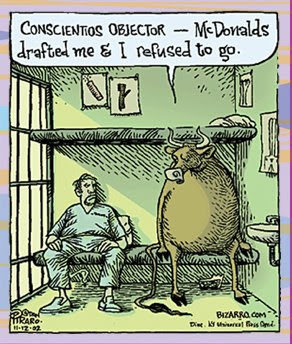 I freely admit I am probably further to the animal-rights side of the spectrum than many of you. Well, I am and I'm not. I don't eat meat but I like to go to the rodeo. I think that if I have to have a job, it's only fair that a horse has to have a job. I consider my horse to be my employee, but I also seem to be pensioning out a whole bunch of other peoples' employees at my expense, LOL! I'm not anti-racing, I just wish they'd let them grow up first and crack down on the drug abuse. Etc., etc., etc. But every time these slaughter/anti-slaughter debates start, someone comes out talking about how we anti-slaughter/animal rescue people should care more about children than horses, or whatever. Why? I truly do not get it. I never have. WHY are animals less valuable than humans? WHY do they have less right to be protected from suffering? WHY are they less important to get out of a burning building? It can't be because they're less intelligent, because so are the mentally retarded, and the human-centric folks would argue they have the same value and right to life as an intelligent human. And intelligence is subjective, anyway. My horses would survive much longer in the wild than I would. Hell, I practically have convulsions if I have to go more than two waking hours without caffeine. So, without using the "humans have a SOUL" or "because God said so" excuse, can anybody tell me WHY human beings are more valuable and have more right to life than animals? By the way, I'm not particularly fond of the "obviously we're the most important 'cause we can kill and control everything else" excuse. That doesn't make us look so noble, ya know. P.S. Likewise, I'm not doing this to judge anybody else. I used to eat meat. I finally realized that if I thought about where it came from, I nearly puked, so that was probably a sign I should stop. So I did. I just think it's good for all of us to question everything and really examine ourselves, what we believe and why we believe it. That's how we evolve - that's how our entire culture evolves. Yeah, I was fun as a child - my second grade teacher nearly killed me for asking why we had to send Valentines to people we hated and why we needed to learn math when everybody would have calculators by the time we were grown-ups, LOL!